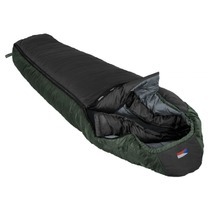 The PRIMA Classic Lhotse sleeping bags are well stitched with Czech seamstresses. They have a classical shape, ie front and rear part. They are sewn from classic quality "sleeping" fabrics commonly used by other manufacturers of top class sleeping bags. They are two-color, the first color is on the outside and the other is inside. Climashield XP / APEX is the most effective thermal insulation material in today's global global market. It is the direct successor to the legendary Polarguard 3D / Delta insulation. It is the absolute world leader in isolation. The strongest, most durable, lightest, highly durable, flexible, quick-drying. Compared to any competitor, it retains the longest "loft", including reuse, washing and drying. Its extremely robust three-dimensional 3D structure - the same as for feathers - is made of thermally bonded cross-linked fibers with a cavity of triangular cross-section. Diameter The fibers are right in the middle between classical hollow fibers and microfibers.